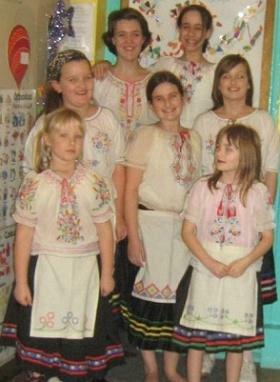 We have a number of handmade Hungarian blouses which date back to the 1930s; they are very fragile fine cotton. They are beautifully embroidered with mostly floral motifs. The skirts were made by Miss W. Beer after the War from blackout curtains and are decorated with ribbon and/or braid above the hem. The white cotton aprons have an embroidered border. More than one white petticoat should be worn under the skirt, which accentuates the movement of the dance.